A group of art friends have started a Color Journal Tip-In Round Robin. The colors for my first set of pages are olive and teal. 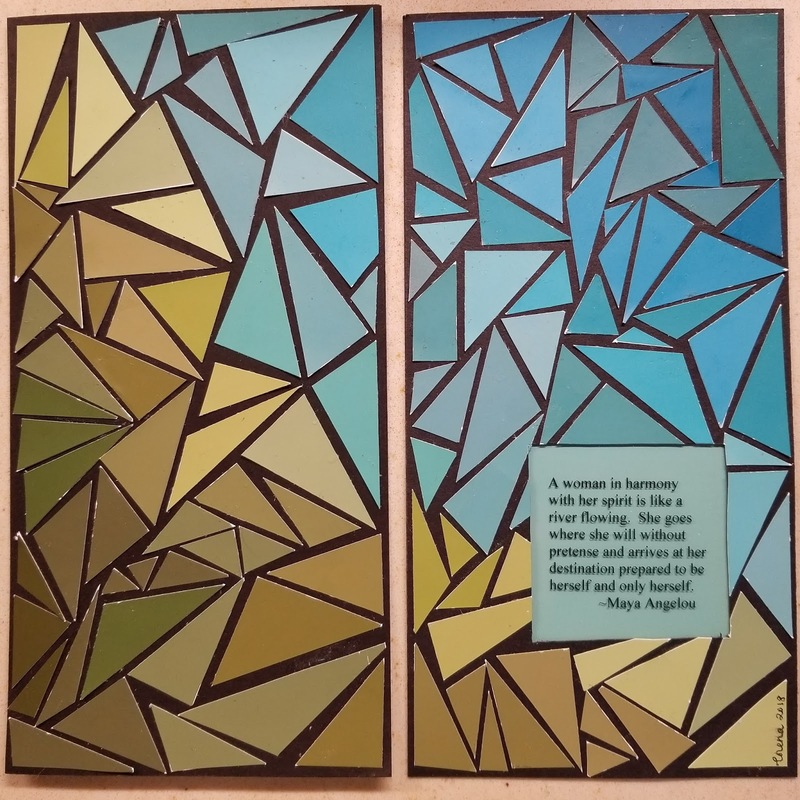 I hadn't given much thought to what I would make with these two colors but as I was driving along a street on my lunch hour the other week, I saw a beautiful mural painted on the side of a building. 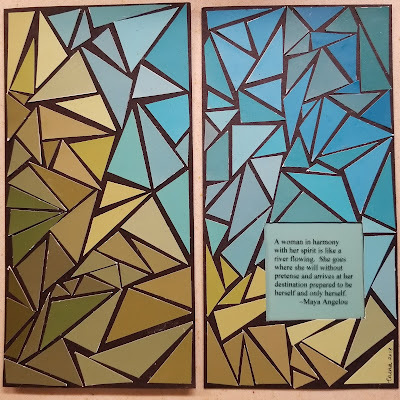 The mural was made of painted shards of color resembling a mosaic. It was so vibrant with all the warm colors. I loved how the use of these smaller mosaic pieces allowed for a smooth transition of color from yellow to orange to red. And, in that instant, I knew what I would do for my pages. I went to Wal-mart and headed straight to the paint department where I raided the paint chips from olive to teal and all the colors in between! 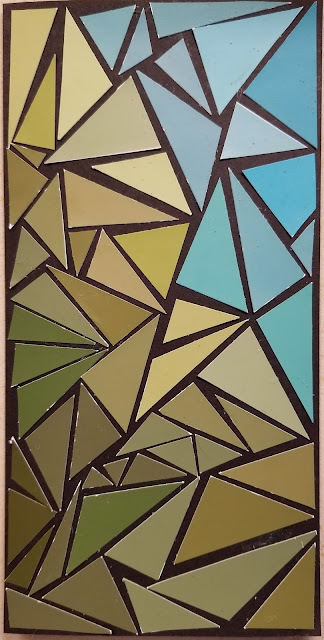 When I was ready to begin, I played with the paint chips placing them in order from olive to teal, dark to light and when I was happy with the gradation, I started cutting the paint chips into random-sized triangles. It was very relaxing to piece the triangles together gradually moving from olive to teal. Of course, many of the pieces needed to be sized down to fit a particular space but I really enjoyed the process. When the pages were complete and I took a step back, I don't know why, but it loosely reminded me of a river flowing. 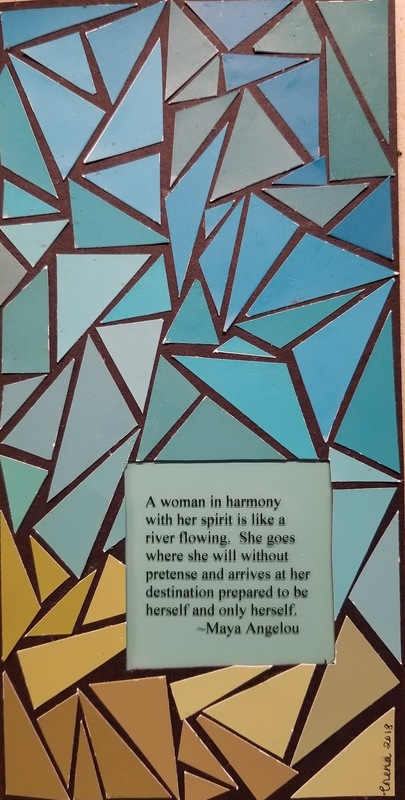 I created a window to frame a quote printed onto a transparency. In this quote, Maya Angelou compares the spirit of a woman in harmony with herself to that of a flowing river. I am the lucky recipient and I have to say, the pages are even more beautiful in person. So happy you like these pages, Eileen! Thank you for the opportunity to work with this new palette! What beautiful and thoughtful pages you’ve created. Thank you for a peek into your creative process, I love your inspiration, resourcefulness, and ability to step back and see the magic. Thank you for your kind words, Pat!! I'll be looking forward to working in your color journal! Thank you Monica! I am enjoying this color journal swap! So nice to hear from you...hope you are keeping busy creating too!